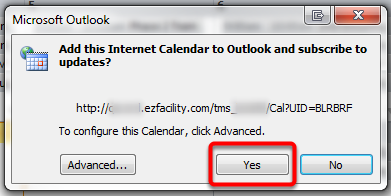 This lesson will show you how to sync your calendar to your Outlook 2010 calendar. ** Please make sure you read How to Sync to External Calendar before you continue with these steps below. In Account Settings choose the Internet Calendars tab, click on New… and Paste the URL you just copied from EZFacility Sync URL into the location and click Add. You can now see the calendar in the list in the Outlook sidebar panel. 1. When viewing your Outlook calendar click on Open Calendar on your toolbar (Ribbon). See How to Sync to External Calendar if you have not copied the EZFacility Sync URL. Click on Ok when you have entered the URL. 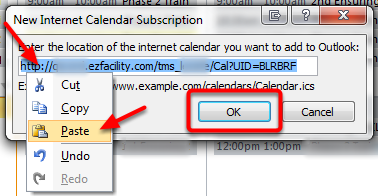 To configure this Calendar, click Advanced. * This will allow you to change the calendar name, enter a description, etc. You can now view your EZFacility Calendar.